In stock 98 pcs. Also available in our walk-in store. In addition to being good pieces of kit, the Dutch modular system is dirt cheap. The price doesn't reflect quality: this is proper army issue built to last. 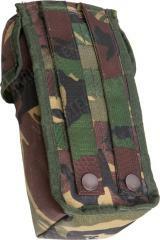 Here's the water bottle pouch. 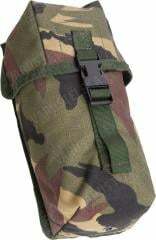 Suitable for a smaller water bottle, or for a lack of a proper magazine pouch you can fit three 7.62 mm AK magazines inside. The mouth of the pouch has a sock with a drawcord to keep your stuff inside and dirt out. Drain grommet in the bottom. Some of the flaps have a "Spanish Fly" closure, others have a regular plastic buckle. Both are good - we haven't separated them. In addition to the visible closure, there's a piece of velcro to keep the lid closed in case you were in too much of a hurry to close the buckle. The hook side can be covered to disable it for silent ninja operation. Attaches to anything with PALS on it, such as MOLLE gear, and even standard belts. Inside dimensions about 7,5 x 8 x 19 cm. 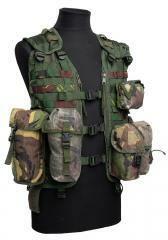 Made of NIR protected cordura, camouflage usually DPM, sometimes Woodland. There might be some slight variations in the minute details of the materials. In used but good serviceable condition. The camouflage might be a bit faded and such, but these kind of things don't affect use at all.